It was only a matter of time before someone would figure out how to weaponize their Kinect. 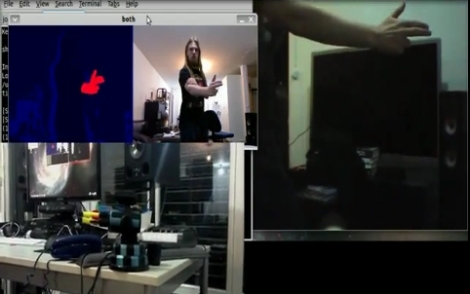 Hacker [Jonas Wagner] was fiddling with his Kinect one day and thought that it would be cool to launch missiles simply by gesturing. Not having any real missiles on hand, he settled for controlling a USB-powered foam missile launcher instead. He mounted a webcam to the top of his rocket launcher to record video of his victims, and with a bit of Python along with the libfreenect ilbrary he was well on his way to world cubicle dominance. The Kinect waits for him to pull his hand out of its holster in dramatic fashion, monitoring his movements for tracking purposes. Once the launcher has been armed, the Kinect watches for [Jonas] to pull his hands out of frame before firing the rocket. We doubt you’ll see this thing controlling weapons for DARPA any time soon, but it’s cool nonetheless. The launcher seems to move a touch slowly, but we’re guessing that with an uprated servo, things could be a bit snappier. Continue reading for a quick video of the Kinect-powered rocket launcher in action.